Ten People Die every day in the U.S. : According to Distraction.gov, the U.S. National Highway Traffic Safety Administration website on distracted driving, there were 3,328 people who were killed in distracted driving accidents in 2012. White male drivers-ages 25 to 64-made up the highest percentage of drivers involved in these fatalities. Can You Afford To Lose $75-$375?? Currently, Utah (one of 41 states), the District of Columbia, Guam, and the U.S. Virgin Islands have bans on texting for all drivers. 12 states ban drivers from using handheld cell phones at all. Some states only have bans on cell phones for novice drivers, while other states — such as our neighbor state Montana — currently do not have any bans regarding distracted driving. Approach stop signs and red lights with care, and look both ways-even when your signal turns green (like my driving instructor told me “Does a red light or stop sign REALLY stop anybody?”). Expect that everyone has a blind spot—and it is your car!! Beware of gaps in lines of traffic-someone may be letting another vehicle (or pedestrian) cross in front of them. 3. Yield-waiting is worth the wait! According to the National Highway Patrol Board, the #1 cause of accidents is….FAILURE TO YIELD. “Nobody ever yielded their way into a collision” makes a great point: If you are in doubt about who has the right of way, give it away. The other guy may be wrong, but do you want to be “dead right”?? If there is doubt about which vehicle should have the right of way, give the other guy the road. When it comes to driving safely, it’s not the principle, but the outcome, that counts. And, even if you know you have the right of way, see Tip #2 above…. This means sometimes driving below the speed limit. Remember the slick, icy, snowy, windy, dark, congested Utah roads-any of these conditions may make the “speed limit” much too fast for safe driving. It cuts your reaction time. It takes farther to stop. Are the risks really worth a few minutes? Seat Belts-need we say any more about seat belts?? ABS (Anti-Lock Brake System) Brakes. ABS brakes prevent uncontrolled skids during hard braking. We will discuss this in our ABS video, which we will post the week of January 20, 2013. Air Bags. Air bags open with a certain amount of violence. They are timed so as you are thrown forward, they expand to fill the intervening space to prevent your impact on harder surfaces. You can be injured by an air bag – but the injuries will usually be minor compared to those you’d experience otherwise. Sit as far back from the steering wheel as you can while still comfortably reaching all the necessary controls, and grip the wheel correctly. High Beam Headlights (switch back and forth from regular to high beam-drivers, pedestrians, and animals will take notice-of you! Car Horn (not slamming on the horn, but tap GENTLY on the horn-they will still hear that!). Light taps of our car horn-and light horn taps more often during driving-actually do more good than harm. 6. Service Your Vehicle Regularly. Safe Driving includes proper vehicle performance, which is why good car care maintenance is important. Inspecting, checking, servicing and/or replacing all of the above regularly helps prevent driving mishaps due to vehicle failure. Take the time to inspect and care for your car or truck, so the harsh Utah winter does not impact your safety while driving. GT Automotive has ASE certified technicians for car repairs for all make and model vehicles. We can inspect your car during our Express Oil change, and help keep your vehicle operating safely in all seasons. Call us today, 801-302-0912, about auto repairs and service in Salt Lake City. Why is October National Car Care Month? Because Salt Lake City fall weather signals changes to driving conditions-outside temperature, road conditions, less daylight, more night time driving. With the incoming of the Utah winter, it’s time to give your car a full system review. Here is your checklist of car care items for you or your auto mechanic to inspect and evaluate, for safe driving, and optimal performance. For most of you-whose time is better spent at work, with family or in your hobbies-your friendly neighborhood auto repair shop (like GT Automotive in South Jordan) will give you this multi-point inspection review, as also noted in our Salt Lake City auto car care video. Check the levels and conditions with your owner’s manual, and make sure to top off these before the season. 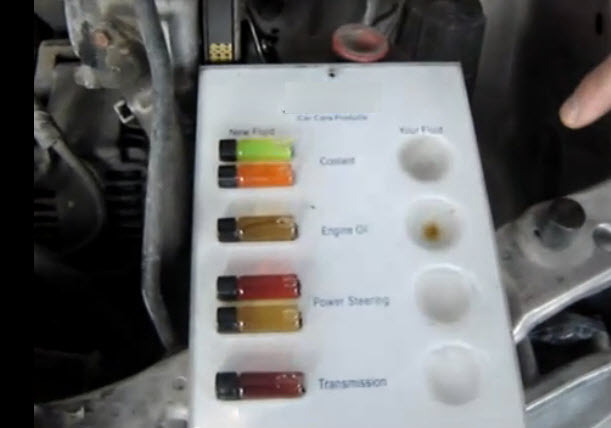 This car care video shows the importance of each vital engine fluid. It won’t take long and it won’t be expensive. If you notice any very low levels, it might be time to have a professional check for leaks. Heat and increased travel during summer, and in the typical Salt Lake City summer heat, can wear out the rotors, shoes, pads, drums and calipers on your brakes. These are complex and computer controlled systems. Anti-lock brake systems (ABS) are equipped with computer sensors on each wheel-exposed to the heat and road temperatures. Brake fluid (the fluid your brake pedal pushes when you apply the brakes) also is susceptible to breakdown under heat. Have your brake pads, calipers, brake fluid and ABS system checked and inspected. With each 10 degree night time plunge in outside temperature (starting at 40 degrees), your car’s charging system require more “juice” (volts from the battery and amperage from your car’s alternator) to start each morning. Increased battery problems in the winter are actually often the result of the summer heat and extended driving. Corroded battery posts or a bulging case can indicate problems. Professional tools are needed to test the juice in your battery. Have your battery cables, battery posts, battery, starter and alternator (all part of your car’s charging system) checked out with your fall season oil change. All Season Tires? Not all tires are all-season tires. In fact, snow tires (those tires with the extra deep “tooth ridges” on the outside edges) or studded tires (tires with small metal studs that grip even icy roads) may be a safer option for your vehicle, depending upon make and model. Check with your tire and auto specialist to determine if snow or studded tires are a better choice for the winter season, than your current set of tires on the car. Tire Tread Depth. Check the tires for their tread life and any worn or bald spots. Rotating tires regularly can prevent uneven wearing and increase the life of every tire on your car. Tire Pressure. Heat expands, cold contracts, correct? That applies to your tire pressure. Cold weather makes for lower tire pressure, so you will need to fill your tire with more air to reach correct pressure specifications in the cold winter months. Checking for the right tire pressure is important to do every month, but it is even more important as you move into winter. Your wipers are your key to visibility, and they are easy to replace and relatively inexpensive. You can visually inspect your wipers for pits and cracks or you can check them as they work. Heat and cold are the enemies of your windshield wipers. Since Salt Lake City Utah has both extremes of weather and temperature, your windshield wipers should probably be changed annually (one hot summer and one cold, snowy, icy winter can be the lifetime of a normal set of windshield wiper blades). If they have good contact and clear water cleanly, you probably won’t need to replace them for the winter. Serpentine Belts drive your water pump, alternator, power steering-a number of engine parts. Serpentine belts can last anywhere from 50,000 to 60,000 miles or more. But, as it is in Utah, extreme heat and cold temperatures can cause them to crack and break at earlier mileage intervals. Check for cracks in belts by inspecting the grooves on the underside of the serpentine belt. Engine Hoses generally last longer than serpentine belts, but also break down over time. Check for cracks, bulges, and uncommon soft spots in hoses, which often appear near the hose clamps that attach the hoses to the radiator or engine. Air filters keep your car operating at peak efficiency and give you the highest fuel efficiency. As cars idle more in winter, this becomes increasingly important. Fuel and PCV breather filters are also part of regularly scheduled maintenance changes, based upon time and mileage. The Cabin Air Filter is like your furnace filter at home, but for your car. It filters out dust, dirt, pollutants and allergens from the air you breathe inside your car. Since some cabin air filters are hard to locate in your car, (as well as hard to replace), a professional technician can inspect and/or replace these vital filters. Winter driving means more driving in the dark. Check the alignment on your headlights to make sure you aren’t blinding other drivers. Make sure all of your brake lights, tail lights and turn signal lights are in good working order. This will make communication easier while on the road, and may keep you from getting pulled over and receiving a “fix-it” or citation ticket. Few things are more important than good car care maintenance. Take the time to inspect, check and fix any problems with your vehicle to ensure you have a safe winter driving season. If your car runs rough on the road or when idling, it’s best to have it checked out by a mechanic. Winter is a time when you are relying more on your car, so it’s worth the investment. Cold weather brings out the worst of your engine, especially if it is already performing poorly. What Causes Poor Engine Performance? Engine Filters need changing (see above). Engine sensors (like oxygen sensors, throttle position or EGR sensors) may malfunction or simply wear out over time and mileage. Exhaust system parts (catalytic converters, mufflers, exhaust manifolds) become restricted or clogged. Electrical system components-computers and regulators. Charging systems (see “Battery” above). Good car care maintenance is important. Take the time to inspect and care for your car or truck, before the harsh Utah winter arrives in full force. Safe and fuel saving performance driving will be the good results you experience! GT Automotive has ASE certified technicians for all make and model vehicles. Call us today, 801-302-0912, about auto repairs and service in Salt Lake City.